Technology neutrality can activate more than ten times greater sustainable development potential than current technology-forcing policies, writes independent researcher Schalk Cloete. 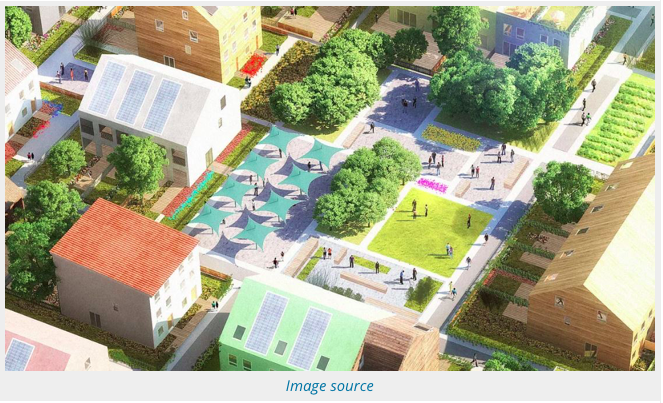 In the second part of a series which follows an article about the dangers of technology-forcing of wind and solar power and battery electric vehicles, Cloete reviews eight alternative sustainable development solutions that he believes have greater climate mitigation potential. The previous article summarized the dangers of current technology-forcing of ideologically attractive wind/solar power and battery electric vehicles (BEVs). 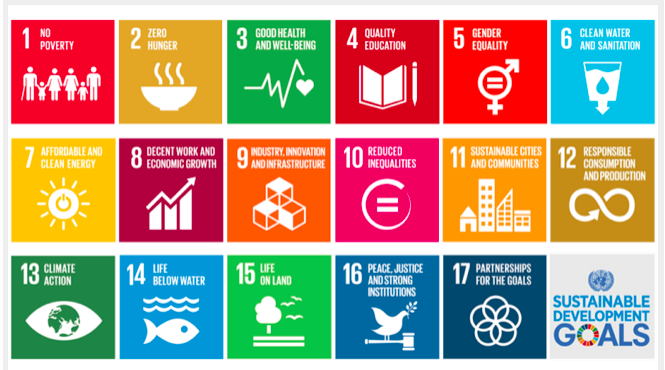 This article will discuss some of the wide range of alternative sustainability channels that would thrive under a proper technology-neutral policy framework, greatly accelerating global progress towards our sustainable development goals. A subsequent article will then make the case that the current norm of promoting a chosen technology class as the dominant solution actually extends the reign of fossil fuels. If we want to move past the current wasteful and unhealthy fossil fueled consumerist mindset, technology neutrality is the best way to get there, while technology-forcing may well hurt more than it helps. The most important pathways to sustainability are listed below in order of importance (IMHO). All of these pathways will be strongly promoted by technology-neutral policies, but are left untapped under current technology-forcing frameworks. The current status quo is to get stuck in the consumerist spiral illustrated below, yielding terribly low life efficiency. Our outdated culture tells people that they should strive to consume themselves to happiness, something that is only remotely possible in a Utopian world of perpetual exponential material expansion. This results in an expensive lifestyle, which forces people to work for money instead of creative expression. 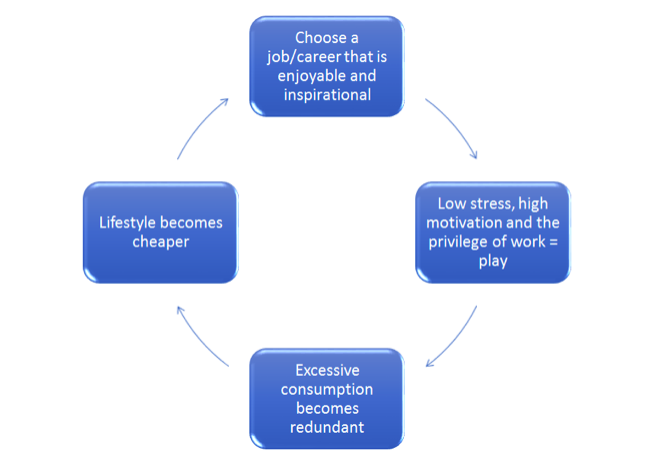 As a result, people are often unhappy in their jobs and, based on their social conditioning, believe that this unhappiness can be alleviated with even more consumption, thus completing the spiral. This spiral represents a massive waste of society’s productive capacity. People force themselves to produce things that do not inspire them so that they can afford the fleeting highs of consuming things produced by other people who are stuck in the same vicious cycle. Globally, this inefficiency is far greater and more harmful than big inefficient SUVs or coal-fired power plants. 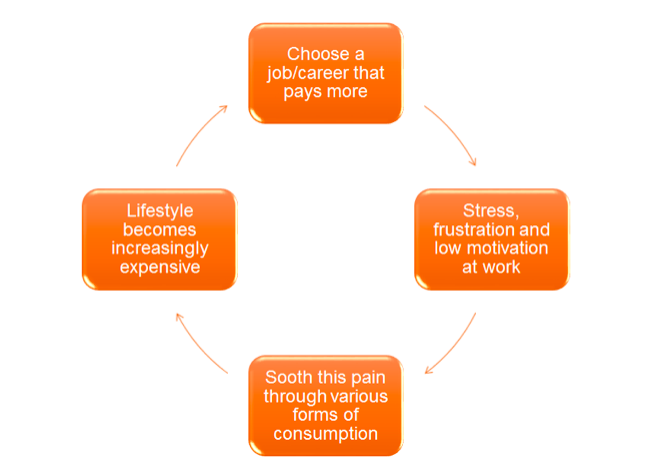 The more evolved alternative to the vicious cycle above is shown below. In my opinion, this virtuous cycle is the key to a sustainable 21st century society. It allows people to increase happiness by producing more and consuming less, thus creating the large surplus productive capacity we will need to overcome our great 21st century sustainability challenge. This cycle will be further strengthened by ever-increasing automation of mundane and uninspiring jobs. This philosophy is certainly growing and I sincerely hope that it will someday reach a tipping point to spread virally through our interconnected society. True technology-neutral policies that generally make wasteful consumerism more expensive could well provide the catalyst that pushes us over this threshold. I am a big fan of car-free living. As emphasized in an earlier article, this philosophy can only moderately reduce transport sector emissions, but it can greatly improve economic efficiency. As a result, it can accelerate economic growth without the associated energy growth, which is crucial for longer-term sustainability. 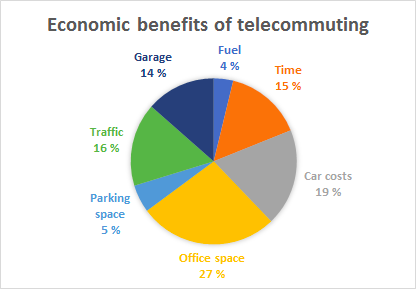 My estimate of the total economic benefits of telecommuting (working from home using a computer connected to the mainframe of your employer) is $18500 per year per person. This is absolutely huge. As shown below, the direct energy (fuel) savings account for a mere 4% of the total saving. The remaining 96% of the economic benefit is spread over a range of other areas. The daily commute is just one area where virtual mobility can generate huge savings. Online retailing and doorstep delivery is already a major trend and is poised for massive future growth. This trend can greatly reduce the fuel, depreciation, maintenance and time costs of driving into town for shopping. Fancy energy-inefficient retail outlets in expensive areas of town can also be replaced by simple and efficient warehouses in cheaper areas, bringing large additional savings. These trends will strengthen with improved telecommunications technology. When virtual meetings approach the efficiency of face-to-face meetings and virtual shopping approaches the efficiency of physical shopping, these trends will be unstoppable. This should happen within the next couple of decades. A broad range of knock-on effects will follow from this development. The most beneficial of these will probably be car-free city zones – economically efficient, clean and highly attractive places to live. Technology-neutral policies addressing climate change, local pollutants, traffic congestion, and true costs of roads and parking spaces can greatly accelerate these positive developments. There are two healthy lifestyle choices that can greatly reduce CO2 emissions: a more plant-based diet without excess calories and more travelling by walking/cycling instead of driving. In general, red meat is very carbon intensive. And like most other carbon intensive things, one can easily learn to live without it. I grew up with lots of red meat, but have now cut it out completely. However, full-out vegetarian or vegan is a step too far for me due to limited carbon benefits and too much compromise to get all the required nutrients. Just as importantly, simply stopping overeating can save a lot of emissions. 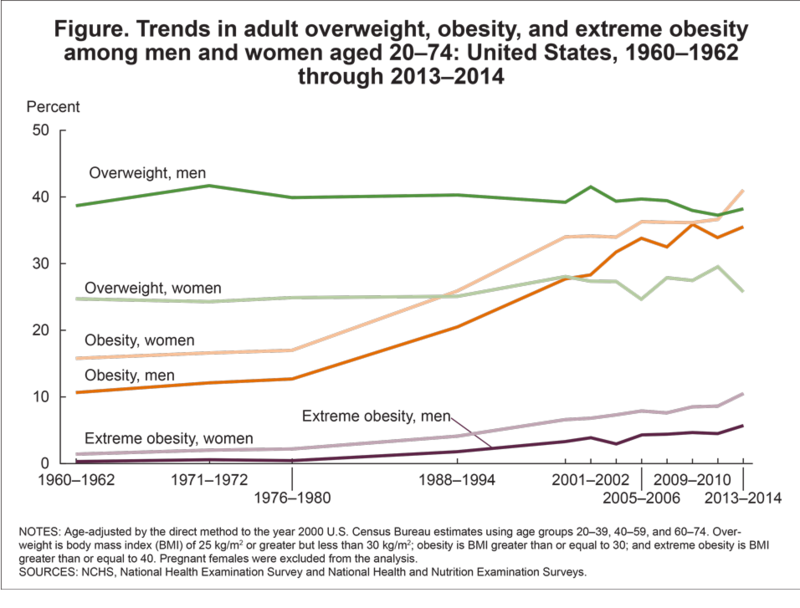 The average American consumes 50% more calories than the recommended daily allowance, shockingly resulting in a mere quarter of the population not being overweight or obese (see below). 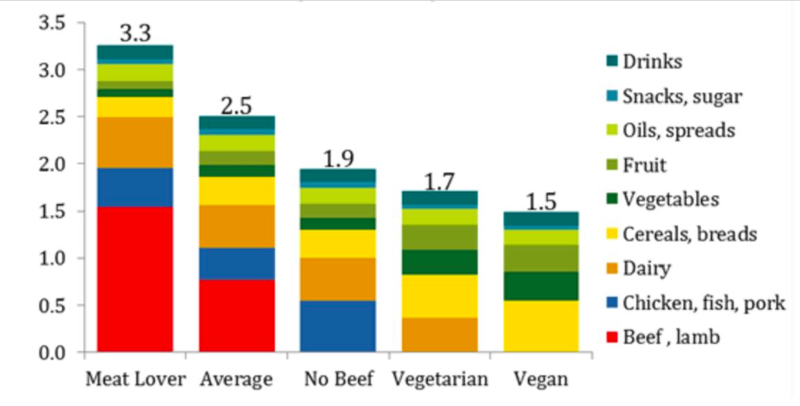 Based on the graph above, the average American meat lover can save a massive 2 tons of CO2 annually by cutting out red meat and reducing calorie intake to healthy levels. Savings in the land footprint required to produce food will be even greater, making it a lot easier for the world to feed its rapidly growing middle class. 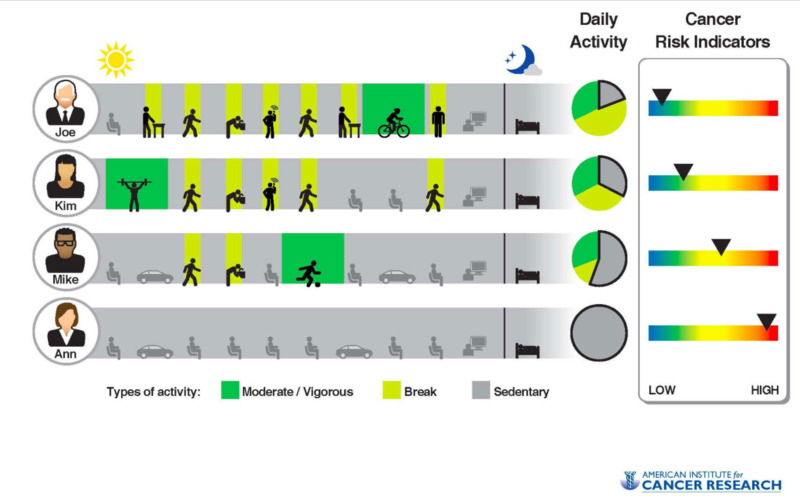 In addition, supplementing the virtual mobility trends above with more walking and cycling can result in substantial carbon savings. Avoiding only 3 miles of daily driving in a large SUV through these channels can cut a ton of CO2 annually. Most importantly, however, obesity and sedentary living are important drivers behind the degenerative disease epidemic sweeping the globe. The US spends an unbelievable 18% of GDP on healthcare, most of which is attributable to so-called “lifestyle diseases”. Lost productivity from poor health adds another large cost. From a macroeconomic point of view, this pattern of directing a lot of productivity towards self-destructive consumption and then spending a lot more productivity to try and minimize the resulting damages is just ridiculously inefficient. This becomes all the more ludicrous when considering that decarbonizing the US economy for a rather high average cost of $100/ton CO2 requires less than 3% of GDP. Technology-neutral policies will automatically make healthy lifestyle choices much cheaper relative to conventional excessive meat-heavy diets and sedentary living. This will directly avoid a lot of carbon emissions and, more importantly, free up a lot of highly educated productive capacity to build a sustainable society instead of fighting our self-imposed lifestyle disease epidemic. Energy efficiency is often cited as the most important sustainability technology class at our disposal. I have recently confirmed that it is generally the lowest cost energy alternative when externalities are accounted for. That being said, energy efficiency still implies a cost relative to the status quo in most cases. The three topics discussed earlier result in net economic benefits (often huge benefits) and therefore have much greater potential to solve our great 21st century sustainability challenge. Energy efficiency can be improved in essentially any application that uses energy. This massive diversity of application makes it especially suitable to technology-neutral policies. Energy efficiency can therefore be expected to do especially well when current inefficient technology-forcing is eventually replaced by technology neutrality. For those who are wondering where autonomous vehicles fit in this list, I categorize this technology partly under energy efficiency and partly as an enabling technology for car-free living (virtual mobility, small electric vehicles and healthy lifestyle choices). 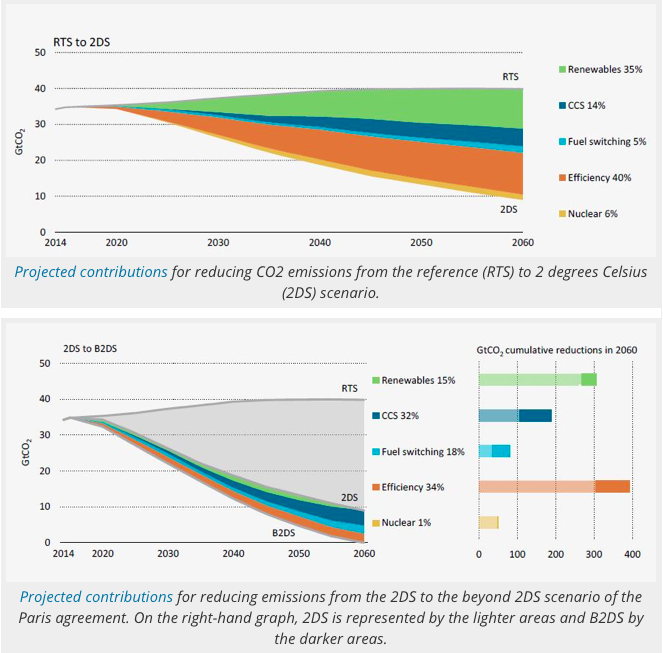 It is now finally becoming more broadly accepted that carbon budgets with a good likelihood of avoiding irreversible climate change damages are not achievable without CCS. Given that most of the global economy is yet to be built, the aggressive climate mitigation pathways illustrated below are simply not going to happen. 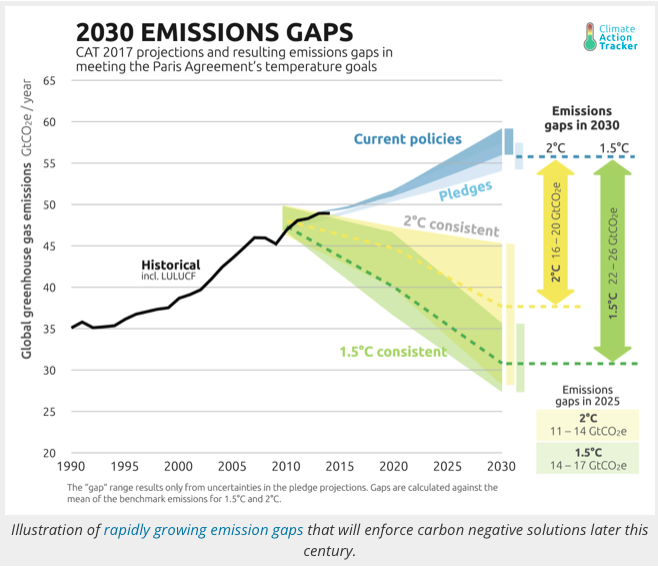 This will result in massive (and growing) emissions gaps by 2030 that will require very rapid emissions reductions and broad deployment of carbon negative solutions later this century. CCS is very well suited to such a belated rapid decarbonization scenario. It can cut industrial emissions that are not accessible through other channels, it can avoid emissions from existing infrastructure through retrofits, and it can achieve negative emissions through bio-CCS and direct air capture. 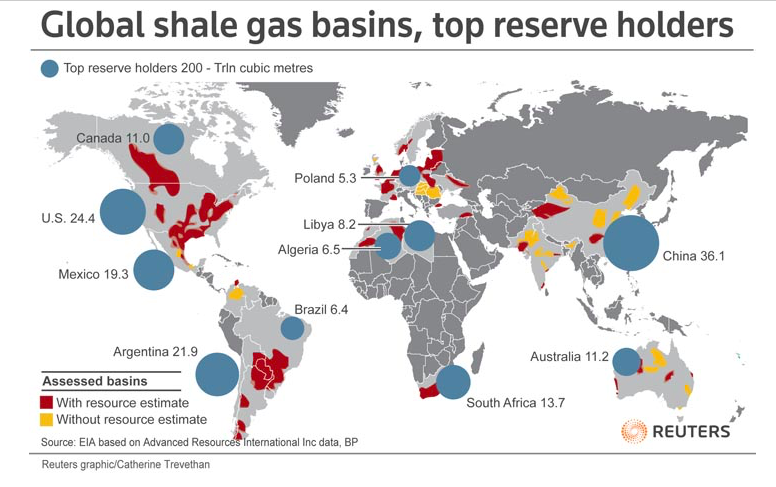 There is also a more controversial reason behind the importance of CCS: fracking. Despite the associated environmental challenges, the enormous positive economic impact of abundant locally produced unconventional oil and gas is undeniable. The US has clearly demonstrated the impact of this controversial technology, having already produced an incredible 7x more energy than the entire world produced from wind and solar to date. Developing nations will not miss out on this growth opportunity, resulting in continued increases in fossil fuel combustion. Abundant CO2 from CCS can also significantly increase productivity from local oil and gas activities through enhanced oil/gas recovery, potentially even replacing water as fracking fluid in water-stressed regions. CCS deployment will happen completely naturally within a technology-neutral CO2 pricing scheme. It is also very important to mention that the longer we delay the implementation of proper technology-neutral policies, the greater the need for CCS becomes. Placing CCS at this position on the list assumes that we will not see meaningful CO2 pricing (over $50/ton in all advanced economies) for at least another decade. Personal mobility in any city that is not built on the American urban sprawl model is well suited to small electric vehicles (SEVs) such as e-bikes, low-speed 3- or 4-wheelers, and electric scooters. This makes SEVs especially applicable to rapidly growing and very densely populated developing world megacities. The main benefit of an SEV is that it can grant similar personal mobility to a car at a small fraction of the cost. 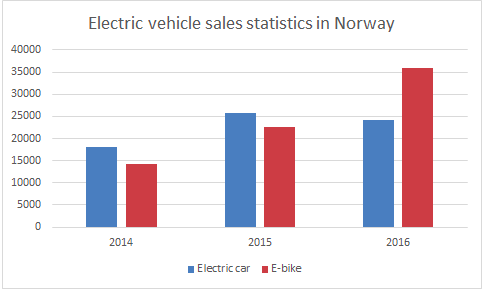 Unsurprisingly, e-bike sales have recently shot past electric car sales in the world’s electric car capital, Norway, where electric cars enjoy a wide range of incentives to the tune of $30000 per car. In China, e-bikes sell about 15 million units per year, while massive electric car technology-forcing achieves about 0.7 million units per year. Technology-neutral policies will level the playing field between SEVs and electric cars, resulting in an even greater SEV dominance. Trends towards virtual mobility and car-free city zones will further boost SEVs relative to electric cars. 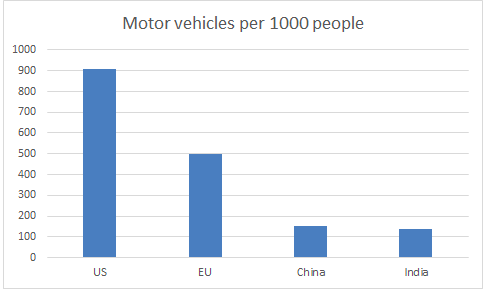 This trend will be especially strong in developing nations where most people simply cannot afford a car, and SEVs are critical to economically include poor communities (as quantified earlier). A previous article reviewed the broad range of fuels that offer an alternative to oil. These fuels are primarily associated with the transport sector, but can also make large contributions when it comes to industrial applications and space heating. In the transport sector, these fuels offer broad applicability to all sectors including heavy freight, aviation and maritime. BEVs are limited primarily to passenger light duty vehicles (PLDVs), where they quickly lose attractiveness for longer-distance applications. The current popular vision of electrifying everything makes very little sense in absence of a true breakthrough in electricity storage (e.g. $30/kWh and 1 kWh/kg fully installed batteries made from truly abundant materials). Until such time, we will be exploiting the inherent highly concentrated energy storage offered by various fuels. Fuels will also remain critical for industrial processes requiring a strong reducing agent or very high grade heat. The market will confirm this notion when technology-neutral policies are eventually implemented. 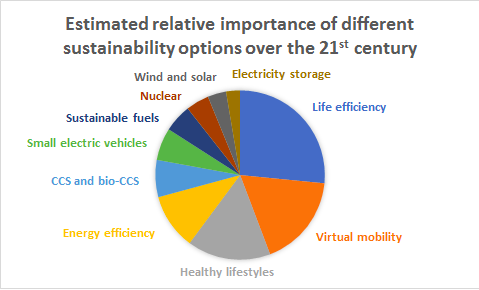 I’ll probably get some criticism for putting nuclear last on the list, but recent history has shown that current nuclear technology will not make a large contribution to 21st century sustainability. 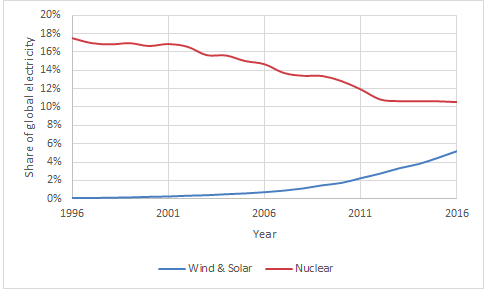 As outlined in an earlier article, however, next-gen nuclear has great potential for the long-term. Wind and solar will probably overtake nuclear in about a decade’s time, but are likely to encounter substantial integration challenges not too long afterwards. At that point, next-gen nuclear will come into clearer focus as a technology with the potential to take society to the goal of a completely sustainable, abundant, reliable and safe global energy supply. An earlier article discussed this in more detail. Technology-neutral policies will naturally benefit nuclear relative to the fossil fuel status quo. These policies are also critical to accelerate the development of next-gen reactors so that they are ready by the time that fossil fuels have built most global infrastructure and wind and solar power encounter major integration challenges. This lengthy article has hopefully illustrated that we have plenty of highly attractive alternatives that are being neglected within current technology-forcing policy frameworks. Technology-neutral policies (primarily a carbon tax) will automatically activate all of these pathways, greatly accelerating the journey to sustainability without hurting economic development. In terms of importance, I would put wind and solar power directly after nuclear, followed by electricity storage technology. They are certainly important players, but are very far from the dominant sustainability solutions suggested by current technology-forcing policies for the reasons outlined in the previous article. Other clean energy solutions such as nuclear fusion, ocean energy, algal or ocean biofuels, and advanced geothermal may also make significant contributions later this century. Our goal over the course of the 21st century is to develop the global economy to the point where everyone has a fair shot at reaching their full potential (currently only about one in every four people enjoy this privilege), and do so within a carbon budget that will probably be well into the red in two decades’ time. As a final illustration, I have made some rough estimates of the fundamental potential of the aforementioned pathways to meet this goal. Current inefficient policy frameworks probably activate less than 10% of the sustainable development potential at our disposal. Simply transitioning from technology-forcing to technology neutrality can turn this 10% into 100%, thereby giving us a fair shot at building a truly sustainable global society. This article was first published on The Energy Collective and is republished here with permission. We need to get people out of taxis and private vehicles and onto public transport with them taking the healthy option by walking or cycling from the station to the office and from home to the station. Good to read this piece recalling important priorities. Changes in mentalities and lifestyles are indeed the most important. Not clear how this can be achieved, but indeed pricing-in the cost of CO2 is a pre-requisite and a good start. Figures for biofuels may need to be checked – yield per acre is very poor. Solar and wind + storage are cheaper than either nuclear or CCS. While BE Light vehicles are as you say over-rated as a contributor to CO2 reductions they are very good at reducing ground level pollution and noise in cities so the various NOx reduction initiatives will force much higher EV penetration than your previous article suggested. Further as China is showing, buses, service vehicles and city and regional freight can be electrified quite effectively without Tesla semis.